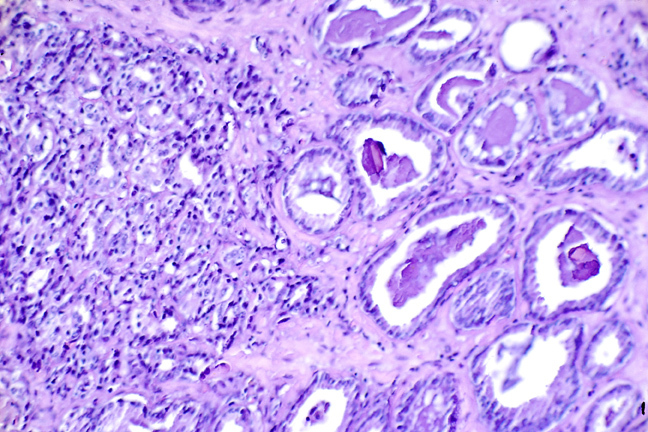 Histological slide showing prostate cancer, the most commonly diagnosed cancer among men in the United States. Image courtesy of National Cancer Institute. Prostate cancer is the most commonly diagnosed cancer among men in the United States. It is also the second-leading cause of cancer death for U.S. men. Most men who die from prostate cancer have metastatic disease. Thus, one goal of prostate cancer researchers is to identify new ways to increase the time before early-stage disease progresses to the metastatic state; apalutamide does just that. At the time of diagnosis, the growth of most prostate cancers is fueled by hormones called androgens, like testosterone. 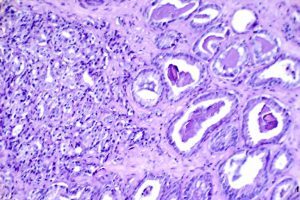 The androgens attach to specific proteins within prostate cancer cells called androgen receptors, in a lock-and-key fashion. The androgen–androgen receptor complexes move to the DNA, promoting the expression of genes that stimulate cell division and survival. This knowledge led researchers to develop treatments that either lower androgen levels in the body or stop androgens from affecting prostate cancer cells. This approach to prostate cancer treatment is called androgen-deprivation therapy, and it is an important part of care for many men with the disease. Prostate cancers that respond to androgen-deprivation therapy are referred to as castration-sensitive prostate cancer. Even though androgen-deprivation therapy is initially successful for most men, causing the prostate cancer to shrink or grow more slowly, in most cases the cancer eventually stops responding to treatment and progresses. At this point, the cancer is referred to as castration-resistant prostate cancer, and another approach to treatment is needed. In men with metastatic castration-resistant prostate cancer, resistance to androgen-deprivation therapy was discovered to be largely caused by reactivation of androgen-receptor signaling through a variety of mechanisms. This led to the development and FDA approval of two second-generation antihormone agents that more effectively deprive prostate cancer of androgens. These therapeutics, abiraterone (Zytiga) and enzalutamide (Xtandi), were approved for treating men with metastatic castration-resistant prostate cancer in 2011 and 2012, respectively. Apalutamide is another second-generation antihormone agent. 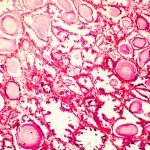 The first information about the discovery and preclinical development of the agent, which was called ARN-509 at the time, was published in the AACR journal Cancer Research six years ago. The approval of apalutamide for treating men with nonmetastatic castration-resistant prostate cancer was based on results from the randomized, placebo-controlled, phase III SPARTAN clinical trial, which were published recently in The New England Journal of Medicine. The data showed that adding apalutamide to standard androgen-deprivation therapy more than doubled the time before the prostate cancer metastasized. The median time to metastasis among the 806 men with nonmetastatic castration-resistant prostate cancer who received apalutamide was 40.5 months, compared with 16.2 months among the 401 who received placebo, which is an increase of more than two years. Data presented at a recent conference showed that enzalutamide also significantly improved the median time before disease metastasized for men with nonmetastatic castration-resistant prostate cancer. Median metastasis-free survival was 36.6 months among the men with nonmetastatic castration-resistant prostate cancer who received enzalutamide, compared with 14.7 among those who received placebo. Thus, it is likely that there will be more treatment options approved for men with nonmetastatic prostate cancer in the near future.